You thought you lost me, eh? No such luck! I knew this would happen. I tend to read larger books at times, and this monstrosity, weighed in at 700+ pages. I finished it this weekend, but I wasn’t able to post, and then on Monday when I was going to, I managed to smash my ring finger between 3 bowling balls at bowling–making typing painful. I can’t really talk about this book alone. 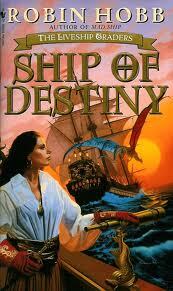 It is the third in The Liveship Traders trilogy, and like many trilogies, none of these books are standalone. This is one, very long story. I think in the end, it probably came in at 2,300 pages (give or take a 1oo). I have been reading this trilogy of a course of a year, plus. Normally, I am a fan of smaller books. Most books I read, as my friends will attest too, I say should be 100-200 pages shorter. This one felt about right. Could it have benefitted from some trimming? Yes, it could have. Yet unlike other monstorous novels, I never felt this one was just being drug on for the sake of extending the story. This book is the conclusion to the stories of the Vivacia, Althea, Kennit, Malta, and Wintrow. I can’t think of a book series in which the character changed more. Each character goes through a very well thought-out arc. I think in the beginning, the only character I liked was Althea, and even she as the novel progressed, was less desirable as she grew as a person, and we saw for what she is. The character that probably takes the biggest change is Malta. Malta, whom I loathed most of the series, chagnes, maybe too abrubtly, at the end of the Mad Ship, and comes full circle to an adult by the end of Ship of Destiny. This is a long series, but it worth the journey if you are a fan of fantasy, good writing, and well-drawn characters. This entry was posted in Reading and tagged reading, robin hobb. Bookmark the permalink.